Grenoble's beauty is in its setting; in the base of a bowl between the Chartreuse mountain range to the north, the Vercors rolling dramatically from west to the south and the Belledonne mountains hemming in the south-eastern side. Grenoble's other great pull is its energy. Famous for its universities and scientific research centres, this is a place full of fresh thinking and fun, with a collection of inspirational museums. And our pick of the best places to stay in Grenoble is ideally situated, bang in the centre of town, to make the most of what's on offer. The spectacularly mountainous surrounds mean this is a great spot for walkers, hikers, climbers, and of course, skiers. Grenoble hosted the Winter Olympics in the 60s, and it is just 45minutes in the car to the nearest ski station. Maybe more for hikers, than skiers, Grenoble's mountains are dotted with some very beautiful lakes. Grenoble's location means it snows most winters, but in summer the amphitheatre of mountains keeps in the heat. If you're looking for the main sights, Grenoble's art museum housed in a smart designer building, is well worth a visit. As is the Natural History Museum, the Musée Archaeologique de Grenoble and the Museum of Resistance and Deportation which tells the history of the French Resistance during WWII. It is definitely worth catching the cable car up to the top of the Bastille Hill, where the 19th Century fortress sits. On a clear day you can see all the way to Mont Blanc. Or hike further it if you're feeling energetic! So with all this to see and so much to do many of the best places to stay in Grenoble are snapped up quickly so do book early. 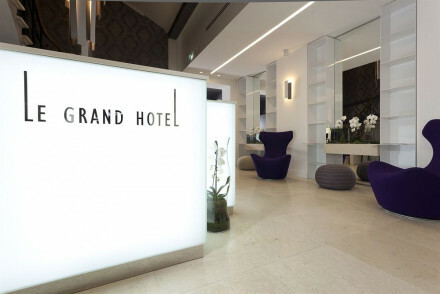 Le Grand Hotel is smart and functional, very close to the centre of town and the main tourist office and a short walk from some of Grenoble's excellent restaurants. This hotel has a business vibe, but so close to the centre that it's certainly one of the best places to stay in Grenoble. Located 15 minutes from the centre of town, Château La Commanderie offers spacious, tastefully decorated classical accommodation as well as a spoiling spa. Tuck into gourmet cuisine from the restaurant before heading for a dip in the indoor or outdoor pool. A spoiling stay! Grand Hotel Uriage, situated 7km southeast of Grenoble, boasts stylish rooms as well as two top-notch restaurants - Les Terraces has won no less than two Michelin stars! There's also a spa, so you'll leave feeling utterly rejuvenated. If you prefer the privacy of a self-catering option then browse through the wide variety available online with our partner Booking.com. If you're coming for the skiing the best snow is generally from mid-December to late February. If however you're here for the hiking then it's warmest in July, with the average daily temperature rising to 20°C. International guests can fly into Grenoble Airport, served by a number of British as well as mainland European destinations. From the airport, take the bus on to your final destination. Browse through our list of all the best places to stay in Grenoble. Widen the net to include our recommendations for the best places to stay in Lyon or Geneva. A chateau 15 minutes away from Grenoble city centre, situated amid a beautiful park with panoramic views available from all rooms. Each room has its own character, sleek and traditional in keeping with the building itself. Plenty of activities on site, as well as tremendous spa facilities. 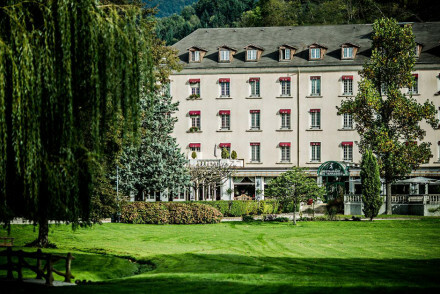 Country hotel sitting at the foot of the French Alps, just 7km from Grenoble. Rooms are comfortable and well furnished with velvet and soft colours; each named for a celebrity who came to stay. Come for 2 Michelin Star food at Les Terrasses and a relaxing spa experience in a historical spa town. Smart, functional and comfortable hotel designed for business people visiting for a short stay. Three conference rooms. Centrally situated, close to the tourist office and the pretty market in the Place Grenette. Bed and breakfast only, but a good choice of gourmet restaurants a short stroll away.